Kelly's Korner is hosting a Show Us Your Favorite Charities/Ministries blog tour. I have shared in the past about Amazima Ministries. A few years ago I found Katie's blog and it blew me away. She planned to go to Uganda for a year when she was 20 to start a program for orphans. God led her to adopt one of the orphans and now she has 14 children and feels called to stay in Uganda. This is Katie with her family. Isn't it unbelievable a young girl would take this on? She chooses to follow God no matter what. 147millionorphans.com has teamed up with Katie and Amazima Ministries. 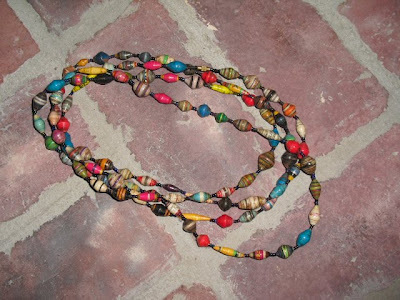 They taught the Ugandan women how to make necklaces out of recycled magazines. It helps them provide for their families and 20% of the proceeds goes back to Amazima. I want to give away one of these necklaces to YOU! Just leave a comment and I will announce the winner on Monday! 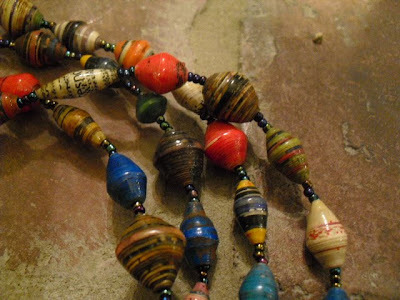 Here's a close up of the beads made from magazines. I love all the colors! I pray my Katie will follow God as boldly as this Katie. Beautiful. All the way around beautiful. What an amazing ministry. Thanks for sharing! I have followed Katie's blog for quite a while....precious, young lady with a dynamic life that is touching so many. Thanks for telling others! Those girls all look soo happy with her!! And what a cute necklace!! What an amazing ministry! The necklaces are beautiful too! Wow! WHat a great ministry! And I think that those necklaces are beautiful! Have a great weekend! I am so thankful that you posted this. I was going to order some of the necklaces for Christmas presents and I couldn't remember the address. I think this is awesome! I love the necklaces. What an inspiring story! And those necklaces are amazing! I just started following her blog and am completely humbled. Thank you for the chance to win one of the necklaces! The necklaces are beautiful, thanks for the chance to win. WOW!!! That is great that such a young girl would take on the 14 children!! She is amazing! Thanks for the chance to win such a meaningful necklace. And I will pray for your unborn Katie to be a Godly woman like the other Katie! This is inspiring. Love your blog - thanks for sharing! I have been following Katie's blog for awhile. It is amazing the work she is doing. What a beautiful and amazing youg woman Katie is! Thanks for sharing. That necklace is awesome and pretty crazy that those beads are made from magazines! This is truly an amazing story of faith and courage! Thanks for sharing, Dina! Oh my goodness! What an amazing girl. So she lives in Uganda now? How long ago did she go? What a story! I have to go check out that site now. ~Hope you are feeling well! That's an awesome story! Thanks for sharing it and doing such a sweet giveaway! This just overwhelms me! Such an encouragement to read! Thanks for sharing! Wow. That's amazing. And the necklaces are beautiful. I'd love to win. And PS... I went to Charming Charlies today. And OMG, I was in love. May return tomorrow! Amazing, what a calling she stands for! Thanks for sharing. Awesome necklaces. I read Katie's blog and she is amazing. I have a special place in my heart for orphans too! My very best friend, Jessica Baker, and her husband, Rusty just adopted their boys from Haiti - about two weeks after the earthquake! This has been about a 2yr process, but since the earthquake, everything was sped up! Jess and Rusty also adopted Isabella 3 yrs ago! They lead such a BLESSED life with their children, even if they didn't come from her own womb!!! What a great story and beautiful necklaces! Isn't it amazing how something so simple can provide for someone...I love it! The world needs more Katies! when I face a rough day with my daughter, I can click on K's link for inspiration, a dose of humbliness, and a peace of joy. thanks for highlighting her mission. LOVE LOVE your blog! I am so excited about your Katie Belle and like everyone else can't wait to see how you decorate her nursery. Love the necklace too - all the colors and even more because of the charity. How's it going with having your house on the market?